MANCHESTER, N.H. - Conner Greene made his Double-A debut one to remember for the Fisher Cats on Thursday night. The righty hurled six shutout innings to lead New Hampshire to a 1-0 victory over the visiting Akron RubberDucks. The win snapped a four-game losing streak to help the Fisher Cats (58-56) keep pace in the Eastern League playoff chase. Greene (W; 1-0) began his night with a walk, one of three he would issue on the night, but he followed it up with a double play in a scoreless first inning. He faced just one above the minimum through three innings, netting a pair of twin killings. In the bottom of the third, the Fisher Cats scored the only run they'd need against Akron starter Mike Clevinger (L; 8-7). Derrick Chung doubled, and then scored on a single by Jorge Flores to put New Hampshire on top at 1-0. Greene recorded his only strikeout in the fourth, then retired eight of the final nine batters he faced. He needed just 70 pitches to work six full innings. He gave up three hits, walked three, struck out one, and induced three double plays. 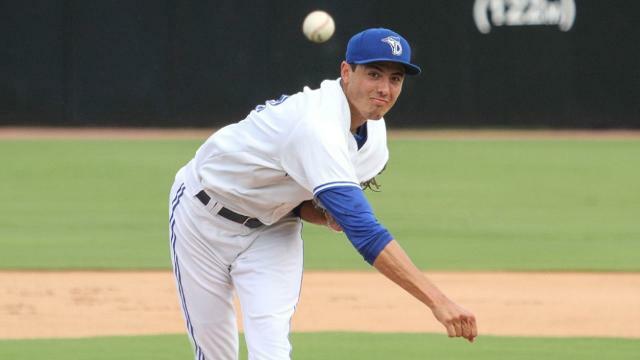 The righty, dating back to July 26 with Dunedin, has allowed just one unearned run over his last 25 innings of work. Cory Burns took over in the seventh, retiring all six men he faced. The righty has now retired 15 batters in a row over his last two outings. He turned it over to Blake McFarland (S; 12), who bounced back from Wednesday's loss to convert his 12th save. Fisher Cats pitchers retired 17 of the final 18 men that came to the plate. The Fisher Cats managed just four hits and were 1-for-9 with runners in scoring position. They stranded six runners, four in at second or third. The Fisher Cats now welcome in the Erie SeaWolves for the start of a three-game series on Friday night at 7:05 p.m. The game features a spectacular Atlas Fireworks show after the game. Red Light Radio performs on the concourse before the game while fans 21+ can enjoy $1 off drafts in the Samuel Adams Bar & Grill up until game time. Tickets are available at www.nhfishercats.com, by calling 603-641-2005, and by visiting the stadium box office. New franchise wins leader Casey Lawrence draws the start in the series opener against Erie lefty Josh Turley (7-9, 3.87). Tom Gauthier and Bob Lipman have the radio call beginning at 6:45 p.m. on the WGIR Fisher Cats Radio Network and www.nhfishercats.com.